Are you new to the beekeeping scene? PerfectBee was formed specifically to help potential new beekeepers take their first steps, as well as to support and inform those already enjoying their bees! But for the completely new beekeeper, those first steps are sometimes confusing. A large part of that can be around the right choice of equipment. I want to share with you the best equipment choices for the beginner beekeeper. It all can feel so overwhelming when you first start out. Do you need all the beekeeping equipment you see on the internet to successfully keep bees? This may seem like a no-brainer, but I really recommend going with the full bee suit instead of just a veil. The reason I recommend this is because when you are first starting out your body is not used to getting stung, so you’ll want to give yourself as much protection as possible. But I’m going to take this one step further. I highly recommend you take the plunge and go with a ventilated bee suit. My husband and I have waited to make this investment but after a few hot summers of keeping our bee friends, it has become painfully clear that the ventilated suit is the only way to go, for us. Others are comfortable with a ventilated jacket and veil combination but, for us, the full bee suit was right. When you first see this protective clothing you may have some concerns because of the holes. I want to tell you now, not to worry. They are too small to get stung through. But you certainly can feel the breeze, which is a nice gift to receive when working with your bees on a hot day. Non-ventilated protective clothing is an option for you if you would like to save a few dollars but, generally, the extra comfort you will get from a ventilated clothing is well worth the extra. I recommend that you start your beekeeping experience off on the right foot. Go ahead and buy the good gloves. What I mean by that, is yo buy the gloves that are made of thicker material. When my husband and I first started beekeeping we were very hesitant. So we didn’t make large investments in our equipment. That was a big mistake. Our original purchase of gloves were the cheapest ones we could find. They were very thin cotton gloves and boy, did we get stung! We have since purchased gloves that are made of much more durable material and our hands have never been more thankful. 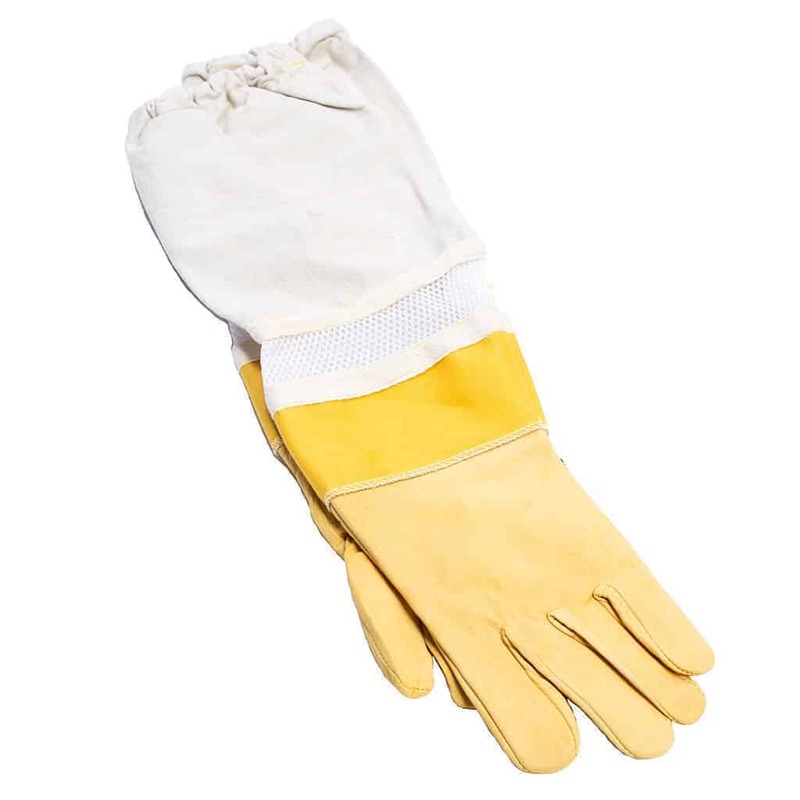 If you are like us, you will want durable, comfortable gloves designed very much to to protect your hands while working in your bees. I’ll shoot straight with you. When my husband and I first got into beekeeping we thought it would be a small hobby. I laugh at that notion now because my husband absolutely loves his bees. It has passed being a small hobby and has turned into a passion and borderline business at this point. So we use Langstroth hives. This is the most common type of beehive and are great if you are planning on expanding your bees. Now, I can tell you that bees will multiply and your operation will expand with them. So if you want to grow your hives then a Langstroth hive might be a good option for you. By the way, for a new, not-yet established hive you should look at using an entrance reducer. Your second option is actually a hive I have never tried but really want to. It is a Top Bar hive. I think they look so cool. These hives are not really all that great for expansion, from my research. But they are great if you want to be a small, hobby beekeeper. Finally, you can also choose a Warre Hive. They are the middle ground between a Langstroth and a Top Bar hive. 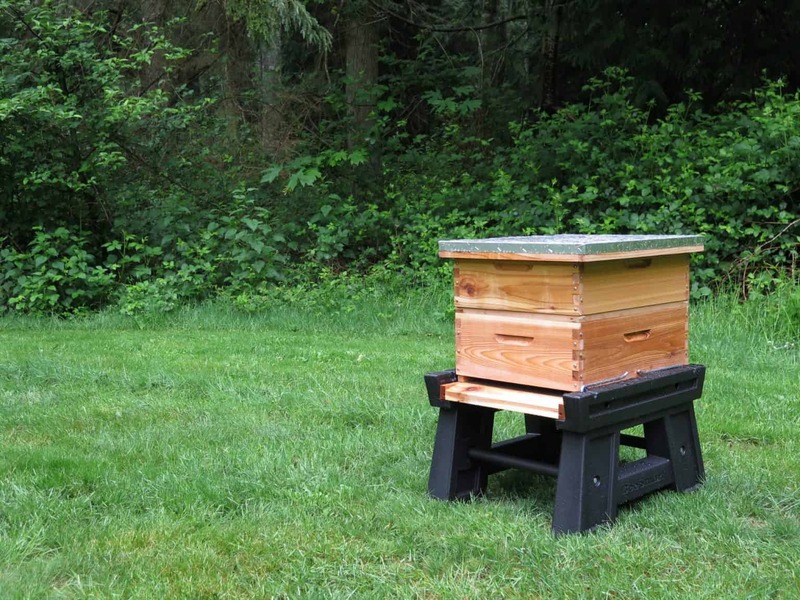 If you are unfamiliar with this type of hive, it is basically a vertical top bar hive. It allows you to allow your bees to perform as they naturally would and give you a more hands-off experience with them. There is a huge debate on which of these hives is actually the best. I’ll say they are all equally functional, if used in the right scenario. I would recommend starting small while you figure out what your long-term goals are for you and your bees. But if your budgets allows, do consider purchasing two hives. The final tools you will need to buy are simply the basics. The first basic is a hive tool. I just recommend buying one of good quality. A solid hive tool is a necessity because you will use it each time you go through your bees. The next basic tool you will need is a hair clip queen catcher. This is vital. I shared my story here about how my husband lost the queen to our first hive and ultimately killed it. If you use a queen catcher when going through your hive, you won’t have that problem. Take it from me, it is better to be safe than sorry. So make the small investment and don’t risk your hive. Then you will also need a smoker and a bee brush. These are very important as the smoker helps you to get in the hive a little easier. All you have to do is place material in the smoker to help it smoke and smoke the frames when you open the hive. It kind of ‘lulls’ the bees so they leave you alone. It is also a good idea to smoke where you get stung to keep the bees at bay. And a bee brush is great to gently sweep the bees off of frames when you are working them. This way you can move them without squashing them. The final basic tool I recommend is foundation. I know a lot of natural beekeepers choose to go foundationless. There is nothing wrong with going foundationless, it just takes the bees a little longer to start producing honey because they have to work a little harder to draw everything out (though this point is not necessarily accepted by proponents of foundationless beekeeping). However, I will say that we started out foundationless; began using foundation; and now are heading back to foundationless again because we raise our own queens now. But I would recommend for the beginner to go with foundation. It will guide you into beekeeping a little easier, I believe. Remember, if you don’t like it you can always go foundationless later. Well, there we have it guys. Beekeeping is a great hobby. It is awesome to see how bees can pollinate and transform your vegetation. And there is absolutely nothing that can compare to fresh honey. So good luck on your new adventure! I hope you enjoy your first round with beekeeping, but I also hope you will keep my tips in mind so you can keep things as pleasant (and protected) as possible. Beyond the important equipment above, beekeepers have access to an extraordinary range of products and gadgets! None are essential and, in many cases, a homemade solution may perfectly viable. But here is a brief list of some other items you may wish to consider. Hive stand. Many – probably most – beekeepers make their own hive stand, for the purposes of reducing the threat of pests and keeping the base of the hive dry. Some products are available, though, for those with deeper pockets and wanting a somewhat more elegant look. Feeder. When getting your hive established, a feeder is important. The exact type to use depends on your choice of hive and there are also ways to build your own. But most beekeepers start with a commercial product. But now I want to hear from you. Do you have any other bee necessities that you would recommend to the beginner?